Don’t forget to bring your employee or discount cards when you visit our MAD Museum. These cards give you discount off adult, concession, child and family tickets. One discount card per transaction, not to be used in The MAD Museum’s gift shop or on group bookings. Please check the expiry date. 1 free Blue Peter badge holder per full paying adult. 10% discount for NHS and emergency workers. 10% discount for UK armed forces and veterans. 10% discount for foster families & children with complex needs. 20% discount with this membership card. Pick up voucher booklets from around Stratford upon Avon in leaflets and brochures, from the Information Centre or by participating in Stratford Town Walks. Photocopies will not be accepted, please check the expiry date. Use Tesco points to pay for your admission into MAD. Find out more. Find this A5 brochure in & around Warwickshire. 10% off admission into The MAD Museum. Travelling by train? Get 2for1 on adult tickets. Find out more. Find this purple map in and around Stratford upon Avon to get 10% off admission into MAD. Added benefits by going on walking tours around Stratford. Get 10% off. Find out more. 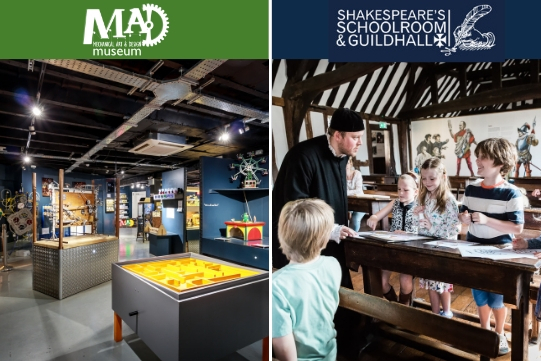 In partnership with Shakespeare’s Schoolroom & Guildhall, we are now offering discounts on adult, concession, child and family tickets! Visit both attractions and save over 20%. Fantastic discount for families and couples visiting Warwickshire. Families – Entry into three visitor attractions and one night’s accommodation with breakfast for £185.00. Couples – three visitor experiences and one night’s accommodation with breakfast for £159.00. Visit 3 top Stratford upon Avon attractions and save over 15%. 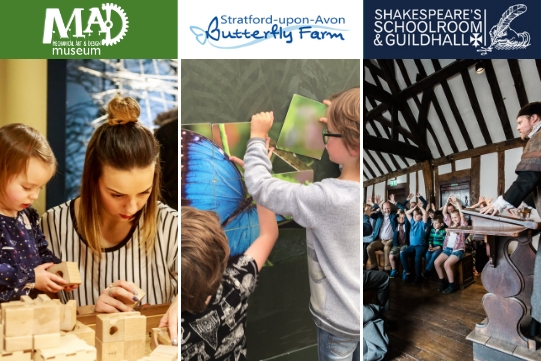 We have joined forces with Stratford Butterfly Farm and Shakespeare’s Schoolroom and Guildhall to offer an exclusive family ticket! Visit any of the top 19 attractions in Warwickshire. Buy 1, 2 or 3 day passes for adults and children, plus get additional discounts at shops, hotels and restaurants. Interested in bringing a group to The MAD Museum? We provide discounts, activity packs, automata construction kits and loads more! Click on the link below to go straight to our Groups page. Whether you’re thinking about birthday parties, school trips or corporate visits, you’ll find all the details right here. Say these codes to a MAD member of staff upon arrival on these dates to redeem your discount. Not to be used in conjunction with any other discounts or vouchers and cannot be purchased with Tesco Clubcard vouchers. 20% off an individual ticket for Mum. 10% off family tickets. Please either say this to a member of staff at MAD’s reception desk or show us the webpage on your phone. Please either say this to a member of staff at MAD’s reception desk or show us this webpage on your phone. 25% off adult, concession, child and family tickets. Our Motor Festival code is – MAD MOTORS! If you have any questions about our different discounts and vouchers, please get in touch. We would be happy to help.